Ever since OnLive launched over a year ago, inquisitive minds have been wondering about their business model. How much of the revenue goes to the developers? How much stays with OnLive? Now, OnLive’s head of developer relations Chris Donahue revealed the revenue split that developers see when they sell a game on OnLive. 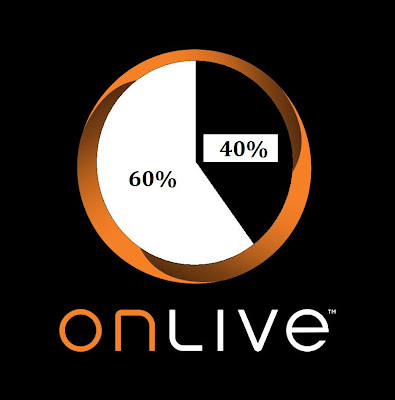 When a game is sold on the cloud gaming service, the developers take 60%, while OnLive keeps 40%. This is pretty much the standard for the video game industry. Although, Google and Apple take only 30% of revenues taken in from their marketplace games. Facebook credits – the social network’s own digital currency – also gives 70 per cent to the developer from in-game transactions and keeps the rest for itself. Valve, meanwhile, does not disclose its revenue split for games published on Steam. The Washington-based group recently stated that its cut is ‘fair but not fixed-rate’. While OnLive takes 40% of revenues, game developers see higher profit margins, according to Chris Donahue. This is mainly because they remove the threat of game piracy that has hindered other forms of media. There are no problems with people downloading pirated games, since the entire game is played in the cloud. Developers are provided with price suggestions and recommendations for the games they are selling on the service. However, they ultimately can price their games as they wish. This gives developers a lot of freedom, to put games on sale, package games together, etc. SOURCES: OnLiveFans and Develop Online. OnLive’s head of Diablo 3 cd keydeveloper relations Chris Donahue revealed the revenue split that developers sell d3 goldsee when they sell a game on OnLive. android phone cheap you're having a great weekend! Sunny day! I don't like the hot day, but when I read your article, I am falling in love with the summer~ Great day, great girl is always be with cheap android phones happy and lucky.